Submitting a maximally reviewer friendly grant application is essential to developing advocacy among the assigned reviewers of your proposal. Document legibility is central to that and refers to the ease with which a reader can distinguish one character from another in a body of text. Legibility involves many factors, such as font type, line spacing, hyphenation, and text alignment. This blog post concentrates on text alignment, and future posts are planned to address other tips to make your proposal reviewer friendly. Text alignment refers to the setting of text flow or image placement in relation to the left and right margins of the document. The four primary types of text alignment include left aligned, right aligned, centered, and justified, with left aligned and justified being the most common orientations. This blog post uses left-aligned text, and the following examples illustrate the difference between justified (flush left and flush right margins) and left aligned (flush left and ragged-right margins) text. 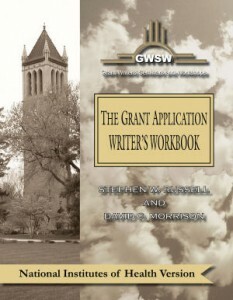 Workshop programs begin with the seminar, Write Winning Grant Proposals. Interested members of the audience then compete for up to 25 positions in this follow-on workshop program. New, renewal and resubmitted applications are eligible. Assistance in responding to prior review is provided to those who write resubmissions. Proposals can utilize any grant mechanism, to any agency, in any discipline. Initial focus is on writing the template or master plan for the rest of the Research Plan/Project Description. That document is reviewed and critiqued as part of an on-site session that includes ample group and one-on-one-interaction with our consultant. The rest of the proposal is then developed following a flexible writing schedule that is tailored to accommodate each participant’s other professional and personal commitments. Workshop programs begin with the seminar, Write Winning Grant Proposals. Interested members of the audience then compete for up to 25 positions in this follow-on workshop program. New, renewal and resubmitted applications are eligible. Assistance in responding to prior review is provided to those who write resubmissions. Proposals can utilize any grant mechanism, to any agency, in any discipline. Initial focus is on writing the template of master plan for the rest of the Research Plan/Project Description. That document is reviewed and critiqued as part of an on-site session that includes ample group and one-on-one interaction with our consultant. The rest of the proposal is then developed following a flexible writing schedule that is tailored to accommodate each participant’s other professional and personal commitments. Which is better for a grant proposal? Justified text looks neat and tidy, and is the orientation used by nearly all books. Many newspapers and magazines also use justified text because they rely on multiple columns of narrow text and justification helps keep the columns visually separate. Of course, newspapers and magazines also break up blocks of dense text with the regular insertion of graphics, subheadings, pull quotes, boxes, etc. By comparison, grant applications are primarily text and often contain long paragraphs, where the use of justified text tends to decrease legibility because it often leads to large, uneven spaces between words that create “rivers of white space” running down the page (see “justified” example above). Left-aligned text may not seem as crisp or neat as justified text due to the ragged right margin, but it provides a relaxed and inviting look. Most websites use left-aligned text and email is never justified. Unlike justified text, left alignment requires no adjusting of uneven spaces between words because imbalances in line spacing always occur at the end of the line (see “left aligned” example above). Also, the ragged right edge of left-aligned, single-column text can enhance legibility by helping the eye find the start of the next line after leaving the end of the previous line; the eye tends to get lost trying to find the beginning of a new line when both margins are flush. For that reason, left-aligned text may increase the ease and speed of reading. Ragged right margins also add variety and interest to text-heavy documents like grant applications. The bottom line is that, while there is no “right” or “wrong” way to align text in a grant application, our recommendation is that applicants use left-aligned text as a way to maximize the readability—and thus reviewer friendliness—of their proposal(s). Do you have an idea for a future GWSW blog post? If so, we’d like to hear from you! Please email your idea to info@grantcentral.com and we will consider it as a focus for a future update.